The ancient Roman calendar gave special names to two days in each month: the Kalendae (in English, “Calends,”)which was the first day of the month; and the Idus (in English the “Ides,”) which was the fifteenth day of March, May, July, and October, but the thirteenth day of every other month. Other days were specified by counting the days until the next Calends or Ides. So, the last day of April was pridie Kalendas Maias, the first day before the Calends of May. 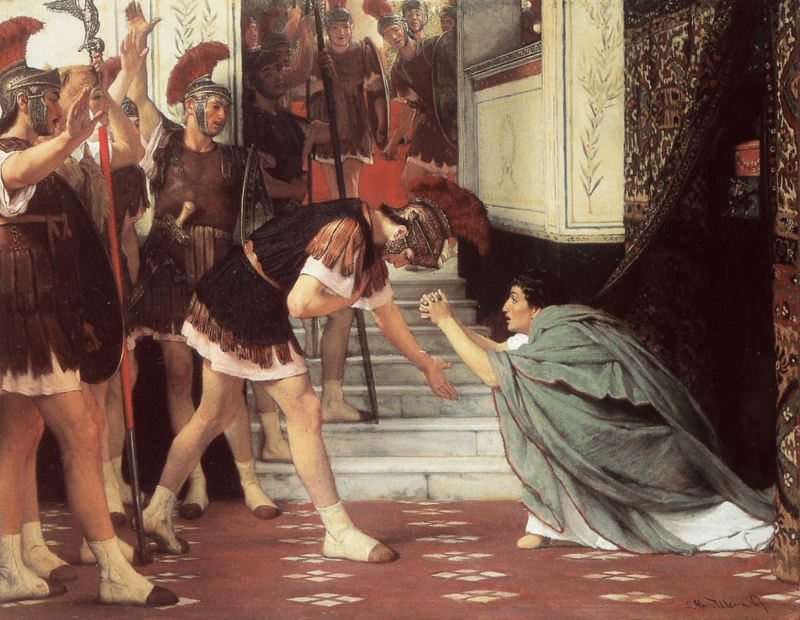 There was some special significance to what came to be called the Nonae (in English the “Nones,”) that is to say, the ninth day before the Ides. So, in March, May, July, and October, the Nones would fall on the seventh day of the month, and in other months they would fall on the fifth day. So today, being the fifth, is the Nonae Decembris. As far as the formal language of law and religion were concerned, this arrangement around the Calends and the Ides constituted the whole internal structure of the month. The Romans did experiment with various forms of the week, most notably an eight-day week that determined when markets would be held. Undoubtedly these sequences of days would also have influenced the Romans’ perceptions of time, even if they were not regularly integrated into the official calendar. I bring this up because of an xkcd strip that appeared a week ago today. Cartoonist Randall Munroe used Google’s Ngram search to tabulate the number of occurrences of each date by its name (ordinal number + month name) in English-language books since 2000. His results suggest that our months do have some kind of internal structure that is not illustrated on our usual calendars. Those simply display numbers in a grid of weeks. Yet Mr Munroe’s findings suggest that there is more to it than that. As the mouseover text points out, in eleven of twelve months the eleventh is mentioned much less often than any other date. The exception is of course September, where references to the events of 11 September 2001 propel that date to the very top of the list of frequently named dates. Yet this pattern was already well-established before 2001, and there is no obvious explanation for it. Some variations in frequency are relatively easy to explain. The first of the month is usually a day when many bills and reports are due, and so the first is among the most named dates of each month. Holidays are also prominent; notice, though, that the eleventh of November, Veterans’ Day in the USA and Remembrance Day in the countries of the Commonwealth, is no bigger on Mr Munroe’s chart than the little elevenths of the other months. The 15th of April is quite prominent; that has traditionally been the day when income taxes were due in the USA. But, in addition to the mystery of the obscured elevenths, we also notice that the fourth and nineteenth are bigger than average in most months. Why would that be? Perhaps it doesn’t mean anything, but perhaps there is some explanation that would become obvious if we were in the habit of thinking of calendars, not as the grids of weeks that are usually tacked on walls in the West, but as structures built around major days, structures like those the ancient Romans used. Too bad we can’t raise some ancient Romans from the dead and put them in charge of investigating the question, their perspective might result in a most fruitful study. I suppose the best substitute would be classical scholars who have spent time studying the ancient Roman calendar. Nowadays there’s a lot of controversy among believers as to what if anything the latest trends in historical scholarship, literary theory, and the social sciences can teach us about how to read holy books. That isn’t new; Professor Maren Niehoff of the Hebrew University of Jerusalem has written a book called Jewish Exegesis and Homeric Scholarship in Alexandria about evidence that sheds light on how the Jews of Alexandria read the Bible in the years from 322 BC to AD 50. The ethnically Greek residents of Alexandria had developed the study of Homer’s poems in directions that sometimes seem unsettlingly modern, and some Jewish Alexandrians had applied their techniques to the study of the Bible. People who think it’s anachronism to hear about Mikhail Bakhtin or Judith Butler or Wolfgang Iser or Wendy Doniger in a study of the Bible might sympathize with ancients like Aristeas and Philo of Alexandria who were incensed with their fellows who seemed to think that you had to read Aristotle and other cutting-edge intellectuals to understand the scriptures. Part II, “Critical Homeric Scholarship in the Fragments of Philo’s Anonymous Colleagues,” situates Philo by demonstrating his differences with his contemporaries. Some anonymous contemporary exegetes, for instance, apply something close to the techniques of comparative mythology to analyze the Tower of Babel episode (comparing it to the myth of the Aloeidae), which he rejects. In their analysis of biblical texts they evidence the influence of Aristotle, and Alexandrian Homeric text-critics, seeing parallels between Homeric epic and the Bible. They place the story of Isaac in a context of actual narratives of child sacrifice, resolving interpretive issues by arguing for historical distance, as Aristotle does in the fragments of the Aporemata Homerica. They thus argue that the Bible, and its religion, has developed and evolved over time. Philo himself espouses a strongly conservative perspective, that Moses has written “eternal, unchanging truth” (95). His contemporaries, in strong contrast, criticize some of God’s acts, such as the confusing of languages in Genesis, as making matters worse for humanity. The section concludes with discussion of how the biblical exegetes, applying Alexandrian Homeric text-critical methods to passages with grammatical problems or flaws in the Greek text, were willing to correct words or phrases. While neither Philo nor his anonymous colleagues know Hebrew (they only know the Old Testament in the LXX), Philo nonetheless argues that the “flaws” could be explained by finding deeper meaning of some sort.